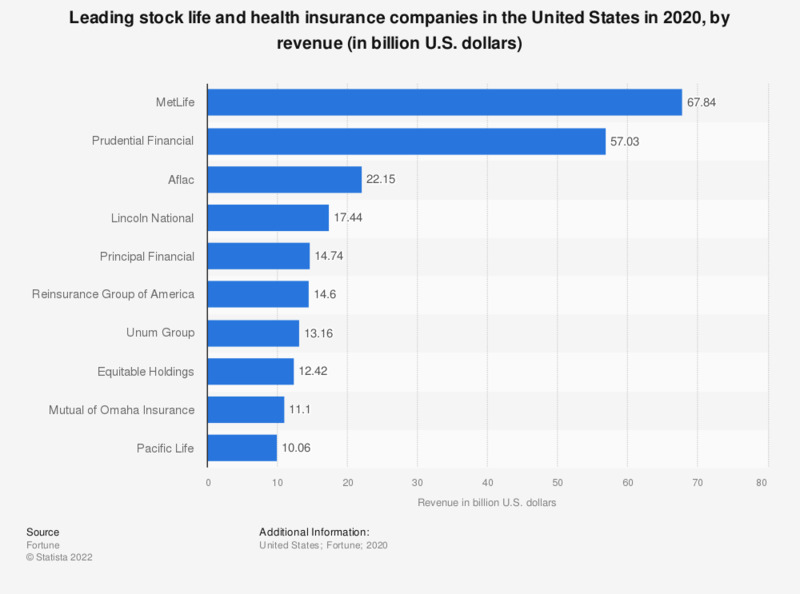 The statistic displays the leading stock life and health insurance companies in the United States in 2017, by revenue. In 2017, Metlife was ranked with revenue amounting to approximately 66.15 billion U.S. dollars. The source adds the following information ":Included in the survey are companies that are incorporated in the U.S. and operate in the U.S. and file financial statements with a government agency. This includes private companies and cooperatives that file a 10-K or a comparable financial statement with a government agency, and mutual insurance companies that file with state regulators. It also includes companies that file with a government agency but are owned by private companies, domestic or foreign, that do not file such financial statements. Excluded are private companies not filing with a government agency; companies incorporated outside the U.S.; and U.S. companies consolidated by other companies, domestic or foreign, that file with a government agency."